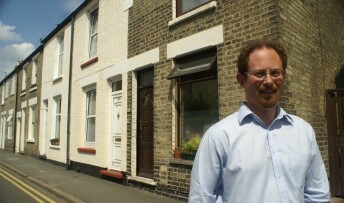 MP Julian Huppert has welcomed the decision not to scrap housing benefits for the under-25s and challenged the Chancellor to admit that the “bizarre idea” was a mistake. Julian had been campaigning to prevent the change to welfare policy which would have left young people without a stable home unable to claim benefits for alternative accommodation. He met representatives from Cambridgeshire and Peterborough YMCA last summer to discuss the move which he feared could drive young people on to the streets. On Wednesday, December 5, after Chancellor George Osborne had delivered his Autumn Statement, Julian said: “One thing I was delighted not to hear in the statement was the Prime Minister’s bizarre idea of scrapping housing benefits for the under-25s. Will the Chancellor tell the House whether it was omitted because he now realises that it would have been a mistake, that not all young people have loving, stable families to live with, and that they need and deserve our support—or was it just that we in the Liberal Democrats would not let him do it? Later Julian said: “The decision to scrap this unworkable and potentially damaging policy is a relief for the many young people who find themselves forced to rely on housing benefit through no fault of their own. “In an ideal world, all young people would have a loving, supportive family they could live with, but that isn’t the reality for some. We cannot just turn our backs on them and leave them without a roof over their heads because we need to save money.